On this day in history, February 1, 1781, North Carolina militia fight at the Battle of Cowan's Ford. After a string of devastating defeats in the South, the Americans began to turn things around in the fall of 1780. After a stunning American victory at the Battle of Cowpens, American General Daniel Morgan headed north into North Carolina followed in hot pursuit by Lt. General Charles Cornwallis. Cornwallis was forced to camp out at the swollen Catawba River, allowing Morgan to meet with American Commander General Nathanael Greene to decide what to do. Numerous fords across the Catawba had to be protected. They decided Morgan would guard Sherrald's Ford, while Brigadier General William Lee Davidson would guard the lower fords. Each would wait as long as they could and then proceed to Salisbury where they would meet General Greene and flee north into Virginia. Greene's strategy was to wear out Cornwallis and pull him away from his supply lines on the coast. General Davidson was a popular North Carolina general who was the chief recruiter for the militia in this region. He had fought at Germantown and been at Valley Forge and was a friend of George Washington. Davidson had only 800 men to guard several fords and he had to spread them out quite thinly to protect them all. Only 25 men were placed at Cowan's Ford, an unusual ford because it had two fording spots on one side of the river. One route was a horse crossing and the other a wagon crossing. The wagon route went straight across the river and was very deep in the center, making it hard for men on horseback to cross. The other route was much more shallow and suitable for men on horseback, but was longer with the opposite landing spot a quarter mile downriver. 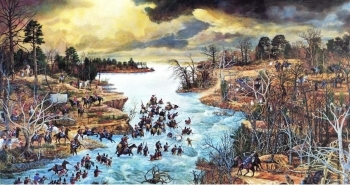 The river began to recede on January 31st and Cornwallis made his move the next morning, choosing to cross at Cowan's Ford. 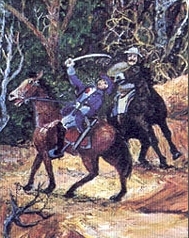 A local Tory served as guide and, knowing the difference between the horse route and the wagon route, began to lead them across the horse route. When the first men were half way across the river, the Americans on the other side noticed them and began firing on them. This spooked the Tory guide, who immediately turned and fled. The British soldiers, not knowing the difference, immediately made their way for the shore at the closest point on the other side. This led them straight into the deep water and greatly hindered the crossing. They had to tie themselves and their horses and equipment together to keep from being swept downriver. Meanwhile, the Americans kept picking them off one by one and a cavalry unit arrived to help them. When the first British troops reached the shore, the Americans began pulling back because the British numbers were too large. Just then, General Davidson arrived to command the forces, but only minutes after arriving, he was struck with a bullet through the heart and died on the spot, causing the remaining Americans to flee. The Battle of Cowan's Ford was a defeat for the Americans, but the delay it provided allowed General Morgan and General Greene to rendezvous their armies and escape to the north, only to fight Cornwallis six weeks later at the Battle of Guilford Courthouse, a battle in which a quarter of Cornwallis' army would be destroyed.